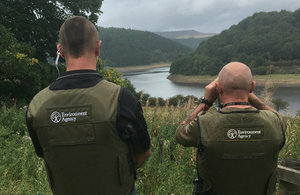 A 26-year-old man has been successfully prosecuted by the Environment Agency after being found guilty of fishing without a licence in August 2018. The case was brought to Northampton Magistrates Court on 18 February 2019 where Michael Burton from Owen Street, Coalville, was proved guilty in absence and ordered to pay a total penalty of £611.47. An annual fishing licence would have cost just £30. The penalty includes a fine of £440 plus costs of £127.47 and a victim surcharge of £44 after Burton was found in breach of the Salmon and Freshwater Fisheries Act (1975) on 7 August 2018 at Hermitage Lake, Coalville. All of the money raised from rod licence sales is used to protect and improve fish stocks and fisheries, benefitting anglers and, for those caught cheating the system, we will always prosecute. Anyone with information about illegal fishing activities can contact the Environment Agency Incident Hotline 24/7 on 0800 80 70 60 or Crimestoppers anonymously on 0800 555 111.